Q Does anybody know the exact route the Tiberius Kirk tour took on 24/07/1999. I have lost my railtour paperwork.I would be most grateful for any help. Q I lived in the Portsmouth area between 1969 and 1985, although I saw 31s, 33s, 47s and 73s regularly I'm unaware of any 37 visits. What prompted me was according to an issue of Rail Express last year or in 2007 (in their modelling section) on modelling petroleum trains there was a diagram of typical petroleum trains one of which was 37003 on Lindsey-Hilsea (Portsmouth) with a train of Esso tanks in 1981, did it actually run down there? Q has got any pictures of D6841 in the period 1965-1973 when I believe it was liveried in BR green with the small yellow warning panel all the time it was numbered D6841. 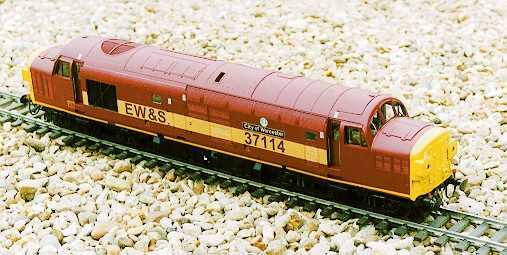 I am having a DJH o gauge kit built of this loco and obviously want to get the model as accurate as possible. Any photos would be most gratefully received. Q has got any pictures of 37219 working 1v16 1635 Waterloo to Yeovil Junction on 17th February 1993 between London and Basingstoke as I was the Driver on this and would like a picture of it if at all possible. A this train worked direct via the main line via Penge East and did not go round the Catford Loop in either direction. Q I have a few headcodes missing form my moves book, can anyone help? 27/8/88 - 37084 Additional 0810 Cardiff - Manchester and 1212 Manchester - Cardiff. headcodes needed. 2/9/90 - 37230 CF-LLS. Train and headcode needed. 27/12/98 - 37420 HLY-BI, BI-HLY. Train and headcode needed. Q I have a set of class 37 air horns which I want to operate. I have an air reserve of 3000 psi but do not know what psi the horns operate at on an actual loco.? . Also if anyone can help me find a drivers horn lever / valve assembly from a 37 I will pay handsomely. Q which locos pulled freight trains over the Kyle line in 1997? 29/01/97 + 17/03/97 + 24/03/97 I'm told it was Motherwell based EWS 37's double heading on those dates? Q 37430 at Crewe where it came on,the train was the (sun)10.30 from Euston-Liverpool dragged by 430 via Chester triangle (to save the run round) & Runcorn. Q Does anyone have any in formation on the works visits of 37035/37183 when they wer allocated to Inverness in the period 1982-1986? Does anyone have any information on the maintenance of the Inverness allocation during the 1982-1986 period? Engine hours etc. 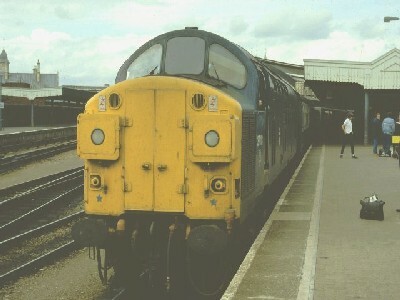 I spent several weeks between these dates timing the locos in the far north and would appreciate any gen.
A Ex-works 37035 was at Peterborough on Sunday 05/06/83. It replaced 40029 (which had failed) on the 16:37 Kings Cross - Newcastle. Alas 37035 also failed due to loss of power, and was rescued by 47002. 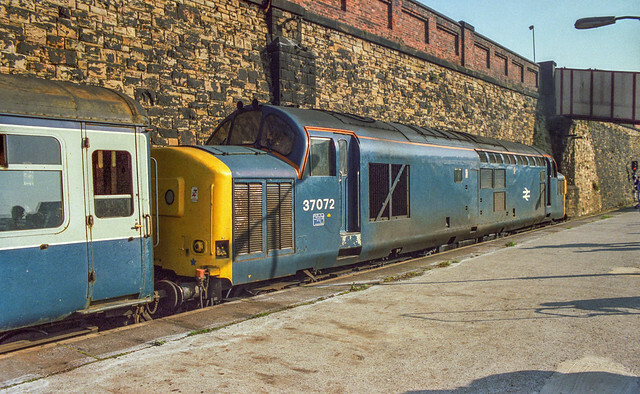 37035 was detached from the train at Doncaster, and returned to the works for rectification, so it probably didn't reach Scotland until mid-June 1983. 37035 was outshopped from Doncaster works from general overhaul and dual brake fitting in May 1983, the date painted on the nose was 05/05/83 as I remember. 183 did not get any classified repairs to my knowledge from Jan 79 until whenever it got converted to 884, 183 arrived and left Inverness complete with frost grilles, buffer skirts and round buffers. As was well talked about at the time, 183 did go to works once in the 1982-86 period-to Swindon to get it's nose fixed after colliding with a tree near Dingwall on 13/01/84 (a Friday as I remember!!). It came back in early April in Large logo, still retaining frost grilles and buffer skirts, which made it instantly unique and recognisable. Q Can anyone tell me what style of BR green was carried by D6769 when she was delivered from Robert Stephenson's at Darlington in July 1962? that is did she carry no yellow or would she have recveived a half yellow panel when new. I ask because someone is going to be making a model of this engine for Microsoft Train Simulator by my request and I woud love it to be as delivered. A D6769 did receive a yellow warning panel from new. Only the first 20 were built without them. I am look for more information about the Fen Drayton to Kings Cross Sand Trains which ran from Fen Drayton (on the old St.Ives line) to Kings Cross until about 1991. I am looking for any pictures of this working, in particular on the Chesterton Jt to Fen Drayton Section. I am also trying to find the answers to the following questions. Q 1. I know that both single 37 and pairs of 31 were used on this service. What date did the 31s replace the 37? 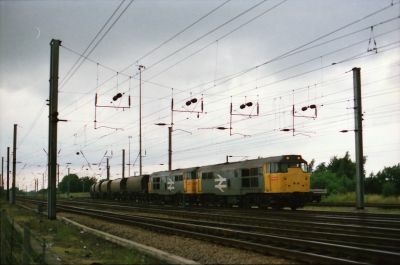 A Class 31s were working the Fen Drayton to Kings Cross Freight Terminal Sand Trains by 1988 as per photos. Q 2. I have heard that towards the end of the service 56 were also used, can anyone confirm this? Q 3. The service used 16t mineral wagon in the early 1970's. by the 1980's these has been replaced by HTV Hopper wagons. These were later replaced by bogie hopper wagons. Can anyone give dates for the change over of wagon type? Also can anyone confirm the type of bogie wagon that was used towards the end? Q 4. Could some please confirm the start and finish dates of this service? Q I am trying to find out if any Class 37 locos ran with the "Leicester Tiger/Panther" plaque. I know that the plaque was fitted to selected Trainload Construction locos outstationed at Leicester for local stone traffic and this is where I grind to a halt. Can anyone out there please help. 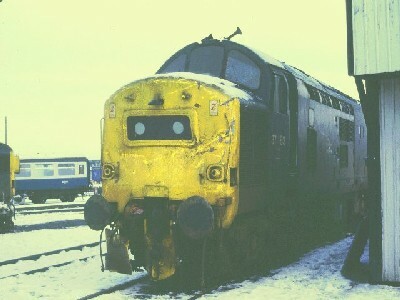 A Several thirty sevens which did turns in the summer of 1984 out of Eastfield, had "springy toffee apple" power demand handles. 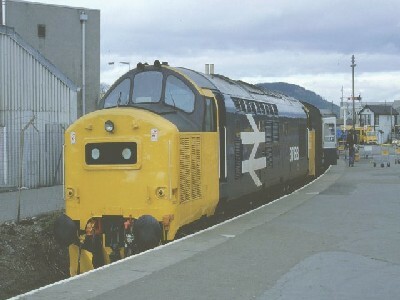 "Fred the skin head " demonstrated this at arrochar once infamously, jumping into a vacant cab of either 37 18x something or maybe 264, and revving the engine on EO - showing how the handle backed down itself. He told me it was a slow-speed control experiment like the duff/3's had. Rail freight was in long term decline and there was already an excess of motive power by 1972 and of diesel electrics even b4 the miners strike. Q 1) Does anyone know the cause of this derailment? Was it directly attributed to the locomotive and that is why the class were then banned? Q 2) Were loco-hauled passenger services north of Dovey Junction withdrawn immediately or did they continue for the rest of the summer timetable behind a different class of loco? A All loco traffic banned for the rest of the season north of Dovey Junction; incidentally forcing the intended steam specials to be diverted to Aberystwyth on 22 & 29/9/91. 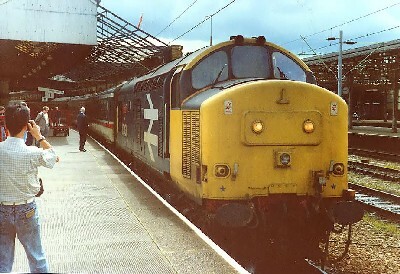 By Summer of 1992 Class 31s were working over the coast but not 37s. 31s worked Pathfinder's tour in June 1994 to Pwllheli which is the last time a loco-hauled passenger train has gone over Barmouth Bridge. there was also a class 31 hauled ballast which was parked in the head shunt at Pwllheli some time in January / February 1995. Paul Japheth photograped a bridge inspection train at Pwllheli, hauled by 31147 in the summer of 1995. Q 3) When was the ban on Class 37s actually lifted over the coast? The latest RAIL magazine (and your web site) refers to a test over Barmouth Viaduct just a couple of weeks ago (the first locomotive to do so in a decade) but I wondered whether there had been any other movements (maybe as far as Tywyn) in the meantime? Q Does anyone have a photo of 37072's No.2 end taken around 1988-90 when the loco was a Speedlink loco at Tinsely ? I think this end had the split boxes removed and replaced with only marker lights - (the no.1 end having had the split box removed in favour of central as in your website picture). The reason for this is that I am looking to model this loco as it is somewhat different from the rest. A I believe that this locomotive suffered severe collision damage in 1985 when runaway 31 (31 102) was routed on to the 37 to stop its momentum. I remember seeing 37 072 at Doncaster Works on an official visit in 1985 with the cab severley stoved in. Saturday 17th September 1988 dawned cold & grey in Sheffield & was similarly uninviting at Skegness. Back at Sheffield late afternoon the weather had considerably improved as 37072 waits for the road to Derby Etches Park with the ECS off 1J26, the 1310 ex Skegness. Over the years several of the original split box machines gained the later centre box modification due to crash damage. Coincidentally a run of three were similarly treated: 072, 073 & 074 with 072 most unusually only gaining the later modification [complete with lamp brackets] at the fan end as late as 1985-6. 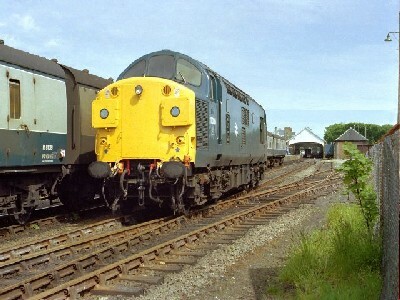 Q A further question, does anyone know of interesting Class 37 turns in the West Wales area in the 88-90 period. A A Tinsley 37 was rostered 04/05 hrs 6B54 Gloucester - Trecwn MOD, then 6xxx Trecwn - Carmathen, then say 16/17 hrs 6M83 Carmathen - Bescot. Q Andy Finch would like to know if the stored tractors at Ayr are in a position to get photographs of ? I'm researching this livery and would like to know if anyone has any images of this loco in it's police livery? Also, does anyone have any images from the TV advert of which it was a star? 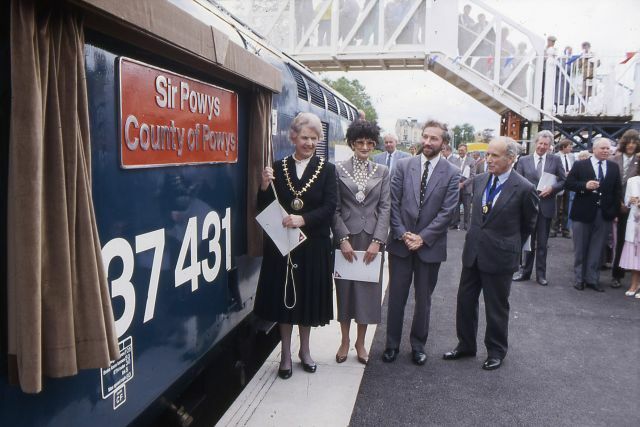 37431 at Llandrindod Wells on 17th June 1987 during it's naming ceremony to COUNTY OF POWYS. QDoes anyone have details of 37s working to Falmouth on service trains? I understand that it has happened as a DMU drag in the 1980s. A 37181 worked the following trains on a dmu drag on 20/07/85. 1830 Falmouth - Truro which ran passenger to Plymouth. QFor several years I have been compiling a booklet on Class 37s. Within this booklet I have recorded renumberings, allocation changes, namings and denamings and livery changes and where the changes took place, if known. What I don't have is the dates and places where the locos were changed from green to standard blue. I would think that most of the repaintings were done in works but maybe one or more of the readers and contributors to this website may have access to this information and might be willing to pass it on. Thanks in anticipation. QI live in a small town called Hedon which is just East of the City of Hull. Dr Beeching closed our line in the late 60's....but I wonder if anyone has records of Hull allocated 37's (or anything else) that ventured our way. We were on the Hull to Withernsea line. I know....bizarre posting, but you never know!! QI've started buliding a model of Eastfield Shed (My Lords!) and I wondered if anybody could supply me with any fots. I have loads already but its never enough. The model is 16ft long, 5 ft wide in the middle and 2 ft long at the ends! It looks quite hellfire already. I'd be grateful if u could help me. As I note from the latest edition of Freightmaster that this train seems to be the only regular 37 turn into S Wales does anyone know how often this train runs? According to Freightmaster it is FX-Q but perhaps someone might know if there is any particular day on which it is best to see it. A The code means the train will run as required on any day except Friday, meaning that there is no possibility of knowing when this train will run. Q37430 at Pwhelli with a set of Inter-City sleeper coaches, probably taken in the early 90's. Why was it there and why sleepers? A The train was a Land Cruise which came up in the morning after stabling overnight at Mach or Aberdovey I think it was in 1990 or maybe 91. This was a 'debut' for sleeping cars on the Cambrian Coast. A The 37 was on a railtour. 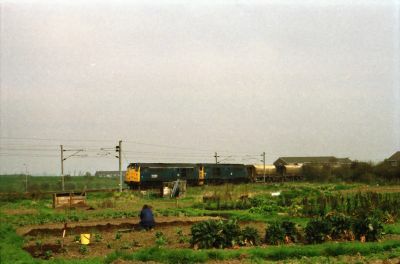 The sleeper cars were shunted into the siding where dmus are normally stabled overnight and left overnight until the train departed the next day. I can't recall the date exactly but it was sometime in 1991 (may?) shortly before 37421 derailed on dovey bridge, after which the class was banned from the line. A I am a Driver on the Talyllyn Railway and this was in the Summer of 1991 during one of my visits. I remember it well because the stock was stabled in the siding at Tywyn - my digs being only a couple of hundred yards from the line. I went down late in the evening to see what was going on - thinking of track work etc. only to find the sleeper stock. There were a lot of moans the following day by locals as the 37 had been on tick over all night to supply the air conditioning for the stock. This was interspersed with a burst of revs every few minutes which only lasted seconds but we all know what a 37 sounds like!! Locals not happy! This was the only time I knew of such a working - maybe the moans reached head office and the experiment was terminated!? A It is possible that the blue 37 Ian Bowland saw at Crewe was 37 029, as this has recently had tyre turning carried out there, however it is only a guess, not fact. QIs this the first 37 to visit Holyhead ? It worked in on a special liner from Felixstowe (I think ) at about 1400 on 8/4/83 returning immediately on another special to Stratford ? This was a major shock at the time when we were use to nothing other than 40's/47's at the time. Can anybody confirm the working ? Was this a first ? A According to my records 37 165 was the first Cl 37 recorded working out of Holyhead @ 16:08 on 8th April 1983. I do not have an inward working so would be grateful of any info generated out of this query. The first recorded passenger workings I have for the class along the coast is 25th June 1968 when D6706/7/9/11 worked four seperate specials from Sheffield to Rhyl, conveying BR employees and their families from the Sheffield area for a day at the seaside. QIvor Bufton has spent the last five years building up a history of D6915 / 37 215 throughout its BR career and would be grateful if anyone has any information on D6915 / 37 215, many people, too numerous too mention have already kindly assisted, however I was wondering, with the advent of e-mail if I could put out another request for help. I am looking for any sort of info eg Sightings, haulage, photographic etc, although I must say that I need at least a date and Location. QMick Ratledge is trying to complete a list of all the 37's which worked on the Cambrian dunring the summer of 1988, he has got all the NB gen but would like some help with the EH stuff. Please have a look at the table below and see if you know any of the missing gen.
Any help for his photographic records would be greatly appreciated. Q On 21st September at around 3p.m. a splitbox grey/yellow Transrail liveried 37 was seen on Motherwell depot. As far as I know there are only two 37's in this condition, 37043 and 37351. Can anyone confirm that it was (or wasn't!) either loco, or perhaps another loco altogether? A This would appear to be the weekly route-learning special which is being run from Eastleigh to Exeter Riverside and return via the old LSW route. 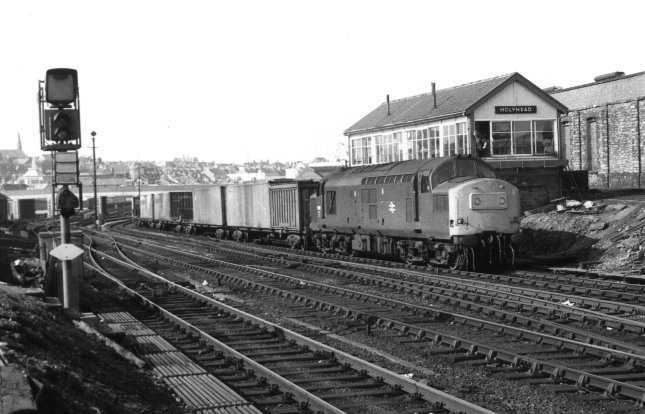 The loco would probably have been 37230 which was reported by Railgen as having run from Eastleigh on this duty. QDuring the early hours of 24th September 1997, the previous night's (i.e. 23/9/97) Aberdeen/Inverness/Fort William-Euston sleepers, on which I was asleep, were dragged somewhere south of Edinburgh (train loco 87032). I know that other trains on that night were dragged (and most were worked by 37's! ), but I haven't read anything about this one. QBetween Bath Spa and Westbury on 13/08/98, a Triple Grey 37 was noticed on what looked like oil tanks, followed 3 minutes later by a Mainline Blue 37 on a ballast train, both going towards Bath. Does anyone know what these were? Ewan Tait caught a glimpes of it as it left Edinburgh. Can anybody help indetify it ? 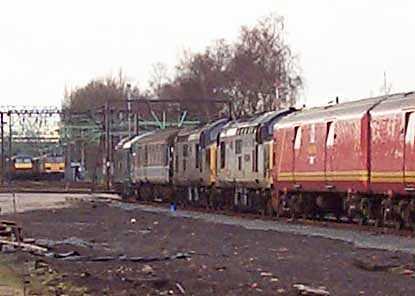 Qon saturday 04/04/98 on bescot at 18.41 there was an inter city 37 parked up on the stabling point with an ews 37 can anyone help with which one it was. I presume it worked in on an enterprise from Warrington.it can only be one of three i think,37152/221 it was not 510 for it was a centre head code one.,and 510 has plated ends. Q I understand that 3 of the return Footex's from Wembley to Middlesborough after the FA Cup got into trouble. One of them had 37375/31450 (the loco's that should have worked A1A Tours train forward from Birmingham), another had a 'grid', and another had 2 x 37, after it failed at somewhere in the North. Do YOU have any hard facts on exactly what happened? 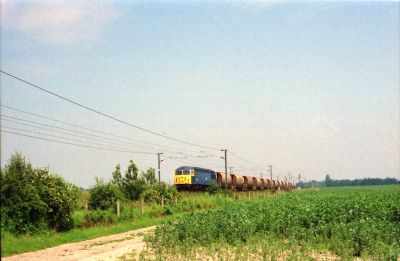 Q On Friday 23rd May 1997 Ed Greenwood was travelling back home to Bridlington and he passed the Hull Tilcon train near Gilberdyke. The train had 2 x 37`s on 1 in Mainline blue and 1 in triple grey. Ed wondered if anyone had the numbers at hand.?? If you have any gen re: this working, please let me know and I'll pass on the results..
A The 2x37 on the Hull Tilcon of 23/05/97 that Mr Greenwood saw were 37372, in Mainline Blue, and 37131, in Triple Grey. 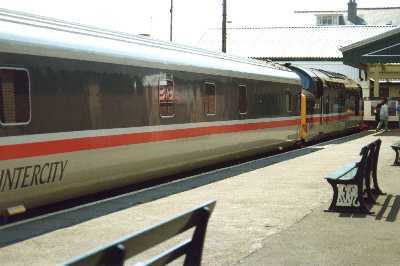 Q Thursday 20th February 1997, Matt Walker was on the 21:30 Euston - Fort William overnight. About 10 miles north of Carlisle, the wires came down due to high winds and a tree, and he was pushed to a yard somewhere north of there (about 15 miles). Can anyone find out what the hell pushed him??? Matt was at the front of the train and didn't get chance to find out what was going on as he was half asleep during this riot at the time. I guess whatever happened will be in the log books somewhere, either at Crewe control or elsewhere, although I suspect Carnforth kicked out a rescue engine or two??? Any ideas ??? A Well, I'm sure this is the same train that featured on the TV news reports the next morning, and was delayed by 10 hours. If it was, then the loco was 37401. I remember seeing this on the report coming back into Carlisle with the stock.